East Winch Wildlife Centre in King's Lynn, Norfolk and three other RSPCA centres save thousands of animals at each location every year as RSPCA hospitals. Hedgehogs and foxes are in A&E there as well as marine creatures. Research on success of seal rehabilitation began with a desire to measure the effectiveness of returning the animal to the wild. The Sea Mammal Research Institute (SMRU) from St Andrews University extended the east coast coverage and provided research expertise. Alison Charles, East Winch's manager, added, "We funded this vital research because we felt it was really important to show people that these seals deserve a second chance and that rehabilitation does work." Sceptics have always previously argued that seal rehab. doesn't produce a fully fit animal. 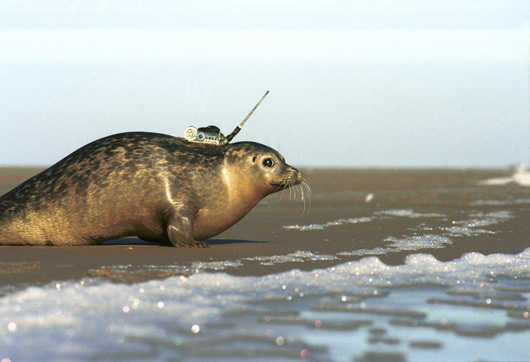 Skippy, who is hand-reared and several other harbour seals (Nero, Hercules, Shrek and Nemo) had satellite transmitters glued to their backs before release. They were then tracked throughout the North Sea for six months. When the seals moult, the transmitters are lost. The details received were such that it was possible to monitor the seals' health as well as track position for the first time. Diving ability was also measured, appearing to be exactly similar to wild seals, as co-author Bernie McConnell of SMRU quotes: "The important finding here is that on release all rehabilitated animals immediately demonstrated diving capabilities that persisted during their tracking periods. And they were similar to capabilities in apparently healthy adults." All seals travelled far from the release site in The Wash in 2004. Weighing 32 kg at release, Skippy was 12.5 kg when she was found at Bacton in Norfolk with an ulcerated mouth and damaged flippers and neck. After oral rehydration, more and more fish was introduced into her diet, with force feeding at first. With Hercules for company, she gained the required weight for release within 155 days.